Making the complex simpler to understand is one of the guiding missions of my life as a journalist. In the last several years, in reporting from Australia, Europe, Asia, and North America, I’ve devoted much of my time to reporting on global energy issues, particularly the coal production and clean energy surge in China; the gas and oil boom in North America, and the promising rise and troubled fall of clean energy prospects in the U.S.
A new piece of this saga is unfolding in Ohio, of all places. Ohio, as you may know, is a center of clean energy manufacturing. During the 2008 campaign, and just prior to the inauguration, President Obama visited Cardinal Fastener, a manufacturer of specialty bolts used in wind energy production. The Legislature approved a decent renewable energy standard for utilities in 2008 (12.5 percent by 2025) and established several loan and investment accounts to encourage clean energy manufacturing and production, resulting in new wind farms and encouraging wind and solar plant expansions. Ohio, as you may not know, also is steadily elevating as a center of oil and natural gas production. The Marcellus shale (natural gas) and the Utica shale (oil and gas) lie beneath much of eastern and southern Ohio. Two weeks ago, Interior Secretary Ken Salazar visited the MAC Liquid Tank Trailer in Kent, Ohio, which expanded its bulk tank and trailer production facility. The equipment hauls water used in fracking deep oil and natural gas wells that are coming online in eastern and southern Ohio, and in neighboring Pennsylvania and West Virginia. A torrent of investment in mineral leases, manufacturing plants, pipeline construction, and drilling platforms signals what business executives and state energy officials say is the most significant surge in oil and gas development in Ohio in decades. Since 2005, Ohio’s employment in the drilling sector has grown by 1,100 jobs, according to an analysis by EMSI, a labor market research group in Idaho. The fossil energy and clean energy narratives are now colliding across Ohio. One poignant example is what’s going on at AK Steel, a Middleton, Ohio company that proposes a $310 million expansion in steel production. The proposal includes deploying new technology to use gases from its blast furnace as a fuel to produce steam for a 100-megawatt electrical power plant rather than emitting a waste gas that it must by law now flare. The co-generation electrical plant would be large enough to power a city of 85,000. Where this idea becomes interesting and relevant to the new state and national energy narratives is what lies behind the plan. 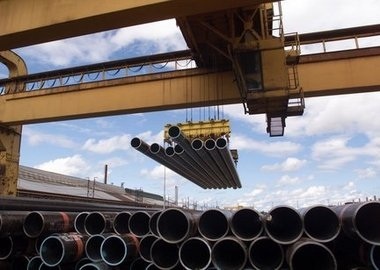 The AK expansion is prompted by rising demand for steel in the growing gas and oil production sector in Ohio, as well as the surging auto industry. Three new steel facilities are under construction in Ohio to serve the energy sector. Another is under construction south of Toledo for auto manufacturing. A fifth $7 billion steel plant, proposed by a Russian-German-American consortium, is under consideration in southern Ohio. AK Steel’s co-generation technology, the company asserts, fits into clean and renewable energy development in Ohio. The U.S. Department of Energy has already approved a $30 million grant for the cogen project. AK steel has asked the Legislature to amend the state’s clean energy development statute so that it can gain some of the $1.5 billion that lawmakers put there when it passed three years ago. If the Legislature agrees, the other new steel plants, as well as Ohio’s existing steel manufacturers, could gain state funds to convert their facilities to produce electricity. John Funk of the Cleveland Plain Dealer wraps up more of the details here. Ohio’s major environmental organizations, among them the Ohio Environmental Council, support the change. So does the NRDC and the EPA. But the state’s wind energy production and manufacturing sector, led by Iberdrola Renewables Inc., opposes the amendment. The wind industry believes it would further disrupt Ohio’s clean energy power markets that are already roiled by low prices for natural gas. Iberdrola executives, who built a 304-megawatt wind farm in Ohio, predict that if the amendment is approved it would end wind farm construction in the state. The debate outlines the steadily mounting influence that oil and gas production is having in Ohio’s clean energy sector, and nationally. Rising oil and gas production is rattling the alternative energy manufacturing and production industry. Simply put, the entire conversation about energy is being turned on its head in Ohio and nationally. Since the 1970s the essential narrative on energy in the U.S. was this: We use too much, and oil and gas reserves are declining. But since 2008 we’ve been using less and domestic supplies are increasing. Those of us who’ve reported on energy all these years anticipated that the technological breakthrough that would alleviate our energy woes would come in the alternative fuels sector — wind, solar, geothermal, algae, cellulosic ethanol, and the like. Wrong. The big breakthrough came in drilling and extraction technology – most specifically in horizontal drilling and high pressure hydro-fracking that is drawing the U.S. steadily closer to an unexpected era of fossil fuel security. See more of my reporting on the American energy boom.